As of May 7, 2018 the Shohei Ohtani 2018 Bowman Chrome Superfractor hasn't yet been pulled. The image provided here is what the card is expected to look like. 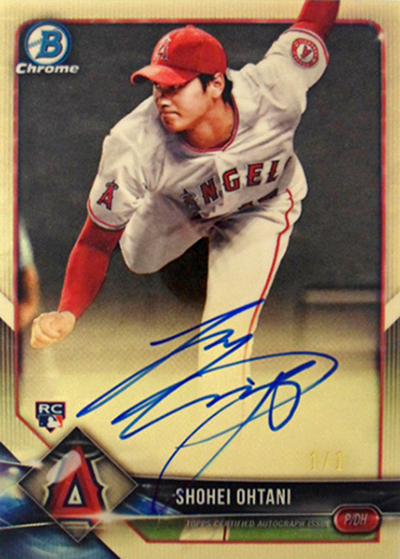 "The lucky collector who pulls the Shohei Ohtani Superfractor autograph from a pack of 2018 Bowman and gets it graded by Beckett Grading Services can collect $75,000 for it from Blowout Cards -- as long as it delivers a BGS 9.5 or better grade and it's delivered to the Blowout offices by May 11, 2018." Just to be clear, all that needs to happen in just four days... Right. Not only is there pressure on the market to pull the card, sub it to BGS, get it back from BGS, AND make sure it gets to BO by this Friday, 5/11, but there's also pressure on BGS to give this card a 9.5+ to ensure PR is leveraged (which may invite the market to question BGSs ethical integrity). Now, I consider myself a positive thinker but I'm also a realist. The likelihood of all that happening by 5/11 is dreamy at best. The actualization of those terms is incredibly unrealistic. I expect BO to extend the schedule if the date passes without a Superfractor, which is almost a certainty given the near impossibility of the initial schedule parameters. While we're living in the clouds, let's play around with that $75k bounty for a moment. The Red Refractor AU (1/5) that just sold has a print run of 5 and closed at $30k. $30k x 5 = $150,000, which is twice the BO bounty. Knowing the market isn't perfect mathematically, can we at least feel maybe a little bit like that $75k bounty is low? While this is just rhetoric, the Supefractor has had quite a bit of coverage. Remember, there are two huge markets here: North America and Asia. This card is going to attract serious attention from both markets when/if it does surface.2)How Much is the 2018 Bowman Chrome Shohei Ohtani Superfractor Autograph Going to Sell For? 2. ↑ How Much is the 2018 Bowman Chrome Shohei Ohtani Superfractor Autograph Going to Sell For?